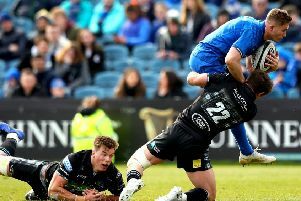 Gregor Townsend insisted his Glasgow Warriors side can become the first team to win an away Pro12 semi-final after their nine-game winning streak ended at the hands of Connacht. Warriors will face Pat Lam’s side in Galway again in the last four in a fortnight’s time, after tries from Bundee Aki and Tiernan O’Halloran saw Connacht to victory in the last league match of the regular season. Warriors played the last 31 minutes with 14 men after tighthead prop Sila Puafisi was shown a straight red card when he lead with his head into a ruck, but Lam’s side were good value for the win at the Sportsground. The result and league positions take Glasgow back across the Irish Sea instead of securing a home tie. “We played a team last year in a similar circumstance, Ulster, last game of the season. We won and then they came back the following week and played really well against us,” said Townsend. “We’d prefer to be at home and we were all out to try and win this game and play at home but we know the opposition much better than we did going into today. Nothing beats that learning for the players and the coaches. When the Tongan prop was sent off the game was tied at 7-7 after Aki’s first-half try and Gordon Reid’s reply early in the second-half. But O’Halloran claimed the winning try to mark his 100th Connacht cap and the home side held out for a memorable win in front of a sold out 7,800 capacity Sportsground. It only took 41 seconds for Warriors’ first scoring chance to materialise when Irish international centre Robbie Henshaw was isolated, but Finn Russell was off the mark from the tee. In the 17th minute, Stuart Hogg was penalised for holding on on the ground under pressure from Jake Heenan and AJ MacGinty pinned Warriors back on their own line. From the line-out ten metres from the try-line Connacht’s maul looked set to make positive yards before it was collapsed, and with the penalty advantage Kieran Marmion and MacGinty linked, before Aki popped up to take the offload and score at the base of the upright. MacGinty chipped over the easy conversion for a 7-0 lead for Connacht, and as the rain began to pour once again, handling errors began to haunt both teams. A blood injury saw Jonny Gray replaced by Tim Swinson after 27 minutes, and the lock made a huge contribution a minute later when he managed to claw Aki back from a certain line-break and try. Connacht were on the front foot straight away though and after MacGinty pushed them into the 22 from a penalty, but the game took a massive twist once Warriors collapsed the maul. Referee Ian Davies had sounded his whistle long before Sila Puafisi entered the ruck leading with his head, and after he made contact with Marmion and Davies consulted the TMO, a red card was the correct result. Connacht continued to press the now 14-man Glasgow side armed with the knowledge that a draw would be no good for their top-two aspirations. After one lineout move misfired when Nakarawa got his hands to the ball, Connacht got a second chance, and this time a crossfield kick from replacement Shane O’Leary picked out O’Halloran for the winning try. O’Leary’s conversion found the target for a 14-7 lead, and from there to the end Warriors piled the pressure on the Connacht 22. But they were happy to defend solidly, and after some multi-phase possession from Warriors ended with a Pat MacArthur knock-on, Connacht easily closed out the remaining minutes to seal their home advantage in the last four.